PDWCS Ltd is one of Lincolnshire’s leading independent specialist window cleaning companies. As a growing business we have worked consistently towards building an excellent reputation for supplying the highest level of service whilst keeping our prices at a realistic level. We are constantly researching new methods of cleaning and we will find specialist techniques for those non-standard jobs. We will work with you to find the best method to achieve the finish you are looking for – whatever the job. Covering areas between Lincoln, Boston, Grantham, Sleaford and Newark, we undertake all aspects of window cleaning. From small residential areas through to large corporate and commercial offices. We also specialise in some of the more unusual projects, such as churches, stately homes and listed buildings. We have grown our business through reputation and pride ourselves in our excellent client retention. Don’t just take our word for it, why don’t you take a look through our testimonial page and see for yourself. Contact us now to arrange for an appointment to discuss your requirements. 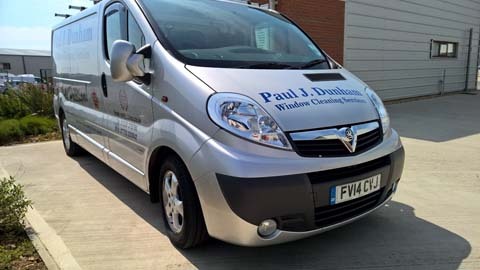 Paul Dunham Window Cleaning Services have been working with Hodgson Elkington now for almost 10 years providing a professional high quality level of service so often lacking in today’s work place. Everyone in our office speaks very highly of you and your staff and we look forward to growing the ongoing good working relationship we have. I have been delighted with the service we have received from the team at Paul Dunham Window Cleaning Services. We have huge amounts of glass to clean regularly, and awkward shutters and fascia to tackle on a less frequent basis. They keep us looking our best, arrive when expected, cause minimal disruption to staff and customers, never complain about anything and always clean up after themselves properly. I have no hesitation in recommending them. To ensure you can fully use all the features of our site, your computer or mobile device will need to accept cookies. Using cookies is the only way we can provide you with certain features of our site. We use a combination of both session and persistent cookies. Session cookies keep track of your current visit and how you navigate the site, persistent cookies enable our website to recognise you as a repeat visitor when you return. The session cookies will be deleted from your computer when you close your browser. Persistent cookies will be removed on a predetermined expiry date, 12 months after it has been initiated, or when deleted by you. If you would prefer to block, limit or delete cookies, you can use your web-browser to do this. Each web-browser has different ways of doing this, so please look at the ‘Help’ menu of your browser to learn how to change your cookie preferences. Or visit www.aboutcookies.org for more information on how to change your cookie settings in a wide variety of different web browsers. Third Party Cookies – Some fn the cookies stored on your computer that relate to our website will not be directly related to us. Google Analytics – This is used by nearly every website in the world and helps us view and analyse visitor information; such as browser versions, visitor numbers, and response to marketing activity. This information enables us to improve the website and your visiting experience. The information stored by these cookies is secure and can only be seen only by us, and Google and never stores any confidential information. Social Share Tools – If you decide to ‘share’ any of our content with friends or associates through any of the social networks – you may be sent cookies from these websites. We cannot control the creation of these cookies, so we suggest you visit the third-party websites for more information about their cookies and how to manage them. Through the use of persistent cookies we monitor the behaviour of individuals who have identified themselves to us. We do this so that we can through our marketing channels deliver the most relevant messages to our customers and the wider audiences we communicate with. A persistent cookie will be deleted on a predetermined expiry date, 12 months after it has been initiated, or by you through your browser settings. Most web browsers have cookies enabled by default. If you don’t have cookies enabled on your computer, it will affect your experience when visiting our site. Please visit www.aboutcookies.org for more information on how to change your cookie settings in a wide variety of different web browsers.